Sidewalk repair will be limited to sidewalks damaged as a result of street tree root growth at various locations throughout the City. Priority will be given to sidewalk locations identified in claims for damages filed with the City, with locations and size of repairs to be determined at a later date. L.A.’s departmental staff worked with electeds to determine how to spend these funds. The proposed “limited sidewalk repair plan” would have split the funding into three equal categories: 1) locations where lawsuits have been filed, 2) iconic streets, and 3) a “50/50 program” where the city and property owner split sidewalk repair costs. There are two wrinkles that further complicate this proposal. There are ongoing sidewalk lawsuits, prominently including Willits Vs. City of Los Angeles – a class action lawsuit over L.A.’s failure to make the public pedestrian right-of-way accessible to disabled people. There’s also a longstanding contention over who is responsible for paying for sidewalk repair: the property owner or the city? The clock is ticking for the $10 million approved, because the city’s fiscal year ends June 30th. The monies don’t need to be completely spent by June, but if the program, inadequate as it is, doesn’t get underway, it’s difficult to justify continuing city budget allocations. 1. Instruct the CAO [City Administrative Officer – effectively the city’s finance department] to coordinate, through June 30, 2014, a Citywide response (excluding the Departments of Water and Power, Harbor, Airport, Transportation, and Sanitation), identifying locations of damaged sidewalks abutting City facilities for repair, and begin implementing repairs. 3. Instruct and/or request the Departments of Water and Power, Harbor, Airport, Department of Transportation, and Sanitation to survey the sidewalks abutting their respective facilities for damage and perform repairs as-needed. Perhaps it’s a tiny step in the right direction that, nearly ten months into its fiscal year, Los Angeles is finally going to get started on spending some already-set-aside money on sidewalk repair. Better late than never. On the other hand, the downsides are numerous. This year’s $10 million already represented a woefully inadequate drop-in-the-bucket amount toward a $1.5 billion backlog. Now, with the focus only on city facility sidewalks, that $10 million won’t be strategically targeted toward areas of greatest need. It’s possible that the city could use up its very limited sidewalk funds on nearly-never-used sidewalks at, say, Ontario Airport – owned by LAX, or other car-centric suburban locations. We tried to bring people to functioning sidewalks with Occupy LA but the cops chased everyone away. This just seems to be the height of laziness. Can’t be bothered to figure out where the biggest need exists to program your paltry sum of money? Then just spend it on yourself! Problem solved. Pfft. Offload the burden of street and sidewalk repair onto the HOAs and business associations. Who better to decide when the street needs repair, or in fact whether the street is wider than necessary and should be narrowed, than the property owners themselves? What we have now is an “unscrupulous diner’s dilemma” situation which is very bad for taxpayers. How disappointing. I’m tempted to argue that the sidewalks in front of city facilities should be the last to be fixed. Why? Because by fixing the places where city officials spend time, you’re giving them a good case of “out of sight, out of mind”. Once they don’t see the problem as regularly, it seems less important. Sadly I am 100% sure Krekorian has been alerted of places where sidewalks are flat out MISSING on major streets in his district, because I’ve personally been the one to give his office the message. Fixing sidewalks on a targeted basis has got to be much more expensive per mile of sidewalk fixed than doing a systematic fix of all the sidewalks. I suppose if you’ve only got 0.6% of the budget you need, then it makes sense to prioritize, but if there is any hope of some day fixing all our sidewalks, then the city needs to just get started and keep going! Wow, they have it pretty bad. 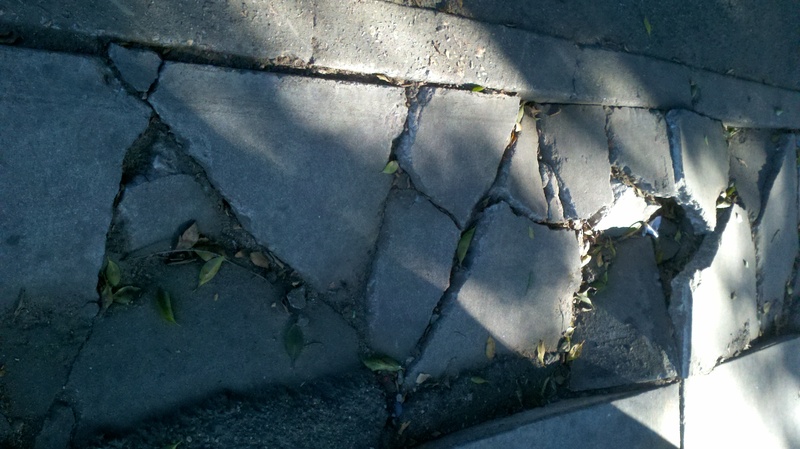 Can’t citizens send the legal language warning an owner to fix their sidewalk to avoid lawsuits? Does anyone have this handy to share? §835.2 (a). A public entity had actual notice of a dangerous condition within the meaning of subdivision (b) of Section 835 if it had actual knowledge of the existence of the condition and knew or should have known of its dangerous character. (1) Whether the existence of the condition and its dangerous character would have been discovered by an inspection system that was reasonably adequate (considering the practicability and cost of inspection weighed against the likelihood and magnitude of the potential danger to which failure to inspect would give rise) to inform the public entity whether the property was safe for the use or uses for which the public entity used or intended others to use the public property and for uses that the public entity actually knew others were making of the public property or adjacent property. (2) Whether the public entity maintained and operated such an inspection system with due care and did not discover the condition. Please pass this along, presenting the city with this will get action.